A Healthy Weight... It's the Math Stupid! OK OK Not the Most Professional way to enter in here But here we are. This is Care Kleen It is a Intestine and Colon Cleanse. 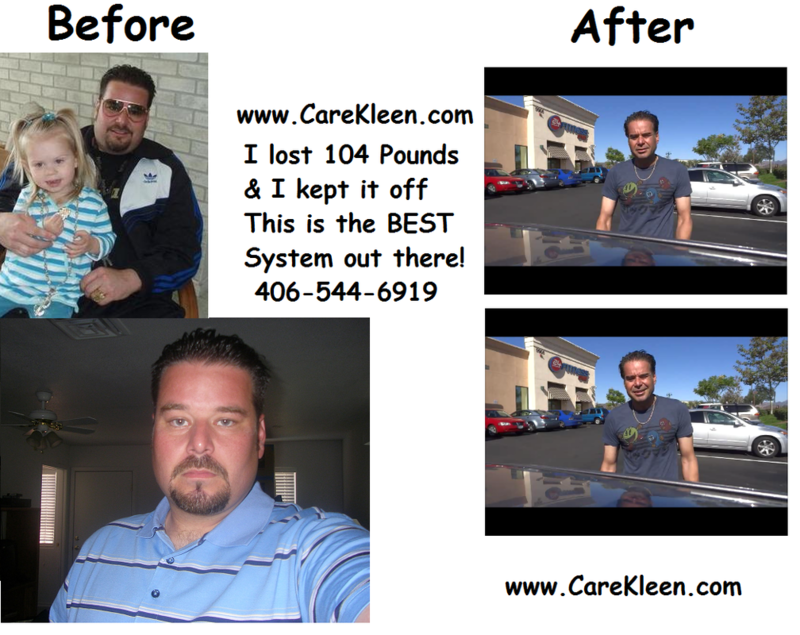 NOT a Weight Loss Product That said I lost 104 Pounds on Care Kleen! and I am SO happy! **** WARNING ******You for sure should NOT start this if your not serious it is just NOT worth it! This is NOT a Easy Cleanse Not something you do like just pop a pill and forget about it!. Also BEFORE starting this or any cleanse or diet Check with your Doctor First. Especially if your on any medications. If you are in good enough health you Must take all medications 30 mins to a Hr BEFORE your cleanse or 2 Hrs after. I will be adding to this for the first few weeks and you will want to re read it and suggest edits etc I am really trying to get this up for Friday March 21st 2014. Hi, my name is Nathan, I want to tell you about my exciting New Product, Care Kleen (CareKleen Colon and Intestinal Cleanse) After the diet pill craze Crashed and Ephadra was outlawed, there was No really, really good Herbal Diet Pills on the market, it took a year and a half to come up with a Energy and Weight Loss Product that worked even marginally close. But our new Herbal Energy Plus FX filled most of the bill, providing Nice, Clean, Pure Energy. Over the next 3 1/2 years, I worked on my New Product and wanted it to be World Class and able to be combined with the Herbal Energy Plus FX. Which is the most potent Energy Allowed By Law. It is with Great Pride that I Introduce to you and Bring to the Market, Care Kleen. (CareKleen Colon and Intestinal Cleanse) is a 3 stage system that is formulated to program for 3 months and 3 more months of Care Kleen (CareKleen Colon and Intestinal Cleanse), stand alone or with the Chemicals and Toxins are Everywhere in this New Millennium. Everything from the Air to our Food and Water Supply is contaminated. If you live in the city, this is many times more Toxic to our bodies. Lets face it our menu is not exactly healthy. From Fast Food to Junk Food, Candy, and Refined Sugar. The average Burger, Fries, and Drink at "Fast Food Giants" Not only Gouges your pocket, it's Killing us. Over 85% of Fat and 69% of Carbs in 1 Meal... WOW, and Dietary Fiber is Basically Non Existent single digits (2%-7%). Refined Foods and Sugar fill most of some folks Diet. Being Over Weight, having No Energy, and Feeling Just Burnt has become just the Norm. Doctors hand out pills like a Vendor selling Hot Dogs. Shrinks and Doctors tell people they will have to take Anti-Depressants, for the rest of their lives. Pharmaceutical Drugs may help some. But, will play a Big roll in Building up Toxins, as well as Smoking, Illicit Drugs, Poor Diet, and Nutrition. Will all lead to Poor Digestion, and Toxic Colon Build up. You can get so Plugged up its Ridiculous. I hear people say they poop once a week or 2 times a week, and I'm like Oh My God!!! That is NOT Healthy. And it doesn't just get better all of a sudden. We have to do something about it. Care Kleen provides exactly what you need to kick cleaning this gunk out of you into high gear so your body can get the nutrients and vitamins out of the food you eat. If your car was that plugged up you would be Stuck in Traffic on the Interstate, Going Nowhere. Imagine how Bloated and Constipated you could be. The normal is 3-12 lbs of waste in everyone. Now this is the same average they also say its normal to poop 2 times a day. So at pooping once a week, just Imagine how much waste you need to evacuate.-----WILL NOT Make You "Run For The Toilet" it's just not like that. You can start my system at anytime without the fear of being "Stuck having to go real BAD". You will however notice that when you do go you will see a lot more of it. The first time I cleansed, I fasted for 3 days, and still was in the bathroom 2 times a day. Cleansing is a essential part of health, you wont to be able to do without once you are in the know. There is NO Fiber in your Diet now! Seriously Look at the Labels its CRAZY Everything is Refined and Processed until it basically has the Least Nutritional Value Possible. One of the Main things that No one really ever gets enough of is Fiber and this leads to very Toxic things as I seen in My journey. Fiber is one of the Most Important Nutrients we MUST HAVE 25-35 grams a day is widely recommended as normal. The average American Diet is way off. My stack of Pancakes Smothered in Butter and Syrup, and the Super, Extra, Bonus, Double, Triple, Whammy Value Meal for dinner, hardly met 10% of my daily requirements. Fruit, Whole Grains, and Vegetables make up some, but only 1-3 grams each. Out fast paced Life Styles just don't allow us to eat 10 pieces of fruit a day. Just finding proper nutrition in any form is hard. Professionally Formulated Fiber Supplement is the Surest way to get what you think you are getting easily and effectively and in seconds. As we fill our systems with bad food choices for years and years, The Digestive System when not fed the fiber needed will clog up with Toxins, Rotten Poop, Dead and Alive Worms and Parasites, Mucus, The Colon Plaque and Toxins in our system will make the Best of us Sluggish, Prone to Sickness and Just feel like Crap. (cause were all full of it... LOL) The USA today reported on January 11th 1999 "Most people who eat the Standard American Goo and Glue Diets have 5-10 pounds of matter stored in the Colon "The Colon is complex with many Turns and Nooks, and Crannies. Harmful Parasites and Bacteria that live on our waste. Our Synergistic or Psyllium + Flax + Other Powerful Herbs work to cleanse and break down the Toxic Matter is Absorbs. I Guarantee you, try my Formula, Care Kleen (CareKleen Colon and Intestinal Cleanse) you will feel like a different person. Tips: Water it is the utmost importance that you drink 1/2 Gallon to 1 Gallon of water daily, the more the better. Drink as much as you can and at least 1 Bottle or 1 Glass with every meal. This is not just when Cleansing, this is a thing that should be done daily. It's just usually Soda, Tea, Coffee, Etc. You are Washing and Cleansing so you MUST use water. It is not necessary to do a 2 hour 6 days a week workout. We are not trying to make you into the Hulk or anything. Any added exercise you can do will make you have more results. Lets face it you probably Don't shovel Coal in a Mine or Lay Railroad Tracks. Basically our Air Conditioned, Heated Offices with Posture Pedic Chairs Etc. Even autos make out lives easy as pie. If you had to ride a horse 5 miles or walk to work. Exercise would be an everyday part of life. As it is you do owe it to yourself to make sure and get some Physical Activity daily. Whether it's taking the stairs instead of the elevator every day, or walking a block or 2, Parking a long way from the Grocery Store, take 3-4 minutes Walking instead of Fighting for parking spot. A 30 minute to 1 hour workout 4 times a week should be a goal, which has nothing to do with Care Kleen (Care Kleen Colon and Intestinal Cleanse). Just all the added up movement etc. will make our system work better. Have you seen what Gym's look like, in the past 5-10 years the equipment makes a workout EASY!!! If you are just anti-workout then stretch, do some washing machines and cherry pickers and sit ups anything that shakes up the midsection. #1 Go Weigh yourself and Agree to weigh yourself everyday! That's right just do it it is VERY easy and Mainly this will put your mind where you need to be and keep you VERY Reality Based on whats going on with what you eat and how it affects you. Some people have No Fat and will gain weight and be truly happy with the results. Why would this be? The Colon is where we Uptake Protein and other Important Nutrients Once You have a Clean Colon your Body will actually be able to utilize the food and Nutrition that you do Uptake! Input all the Correct Data and the Calculator will Spit out a Number That Number is your Basic Metabolic Rate and tells You How Much Fuel you need to Keep Moving and Maintain. This is the Key Number for Weight Loss or Weight Gain! WHY Well to be quite Honest you eat like Crap. From there Oil and Water don't Mix and On and On and On.. Think of the Deep Fat Fried food that takes days for some of it to go through your system and all the Salt or Vodka or?? In your System. The First Step in any Cleanse is to attack this GUNK and try and get through it because there is plenty more GUNK that just cant be gotten to and the Cleanse will not be able to get to for 3-6 weeks with out really sticking to a healthy diet! And SERIOUSLY this is easy!! Ok this is Totally up to you.In My opinion this is one of the MOST Important parts of the Cleanse and I will Be starting My Fast on Tuesday Morning. What is a Fast? Well that's a LONG running Argument. Here is What I mean NO Real Food!! 1 Low Calorie Low Fat Protein drink (Muscle Milk Light or Slim Fast ETC are GREAT!) plain only with water. And THAT'S ALL No Meat No Dairy No Extras No Salt No Soft Drinks NOTHING like that! Nothing to serious and NO I don't sell them etc NOT a Profit thing it is this YOU SHOULD TAKE A MULTI VITAMIN Centrum is Fine or I would Suggest just the Store or Walmart brand is Just fine and the same thing But PLEASE Go get that and a good B Complex also a "Daily Pack" is a GREAT Choice!! But the real thing here is the EFFORT and this will give you an edge if you keep your Vitamin Levels up you will remain in a better mindset and Have more Nutrients to pull from as your body goes through changes this is 1 area that Most EVERY diet falls short on Cause there is not A Lot of Profit in Multi Vitamins unless you overcharge. Also it is VERY hard to Remember to take for most people. This is another reason it is Important to start this NOW! you will be scheduling all sorts of stuff in this system and This will be a GREAT habit to have in 3 Months! HUGE TIP Vitamins must be taken 30 mins to a Hour BEFORE Your Cleanse or 2 Hours AFTER. I suggest After. Also when You take them Drink a FULL Bottle of Water with it Just CHUG as much as you can!! #6 Throw everything out and Go Shopping! Yes waste it, Give it away.. Whatever get it out of your site! EVERYTHING YOU ARE NOT GOING TO EAT Cookies,Chips, Condiments etc Your results will be AMAZING and Temptation Lower without having it there... AND YOU COULD EXPLODE IF YOU EAT THEM...Ok Not really But that was a Great way to check if your still reading! I will Be updating this Page Quite a bit over the Coming weeks and even have some Great Videos to help you out as well! Stomach Grumbles at night or in the Morning are Normal for some people. Some people may even get a few days loose Stool This is Normal for some Most will just go on like Normal but notice they PEE more since water is in n out etc when You do go #2 You will know from Volume and from Smell that this WORKS!! Read the damn labels, in the past years Nutritional facts have become mandatory on all US Foods, there's a reason for this there making junk. Watch you Sodium, Fat, Cholesterol, and Carbohydrates, and you'll see your probably eating too much Fat, Sodium, and Carbs. At a Nationwide Fast Food Restaurants , the average Burger, Fries, and Coke has % Sodium % Fat % Carbs of your daily value and that's rated at 2000 Calorie Diet. A few handfuls of chips can be 40%-50% of your daily Fat mixed with some really good dip, you could eat 70%-80% of your daily value. Turkey, Chicken, and Fish they are really near perfect foods. Look at the labels, Turkey, Fish, and Chicken are 1%-3% Fat, verses the Best Meat is usually 7%-35% Fat. This means 1 serving is % of your daily fat. Watch and Switch these small things and whatever else you can and you will be a whole different person. SO Counting Calories after Figuring Your BMI and BMR and where you want to be. Its NOT just Calories though You MUST get Proper Nutrition! This means proper Amounts of Carbohydrates, Protein, Fiber and YES even Fat. The Worst and something I try and Avoid altogether is Sodium (Salt) There is Plenty in EVERYTHING you touch. 1. Sugar-Soda, Candy, Cake, Etc. Although NOT necessary to "Diet" while on the System to cleanse, what you eat will make a difference in how you cleanse. Cutting your Carbs, Sodium, Fat, and Sugar to within 100% of our daily allowance isn’t hard, it’s what we are suppose to be doing without dieting. Just east like you should and count Calories, Fat, Carbs, and Sodium. Keep it all at 100% or under of your Daily Value. I will add more info later. Recommendations: Eating 99% Fat Free Turkey, or Chicken, will help you to get more protein and less fat than Beef 1 oz of Steak has more Fat than 8 oz of Turkey or Turkey Breast. Ground Turkey Hamburgers or Tacos will ease your want for Beef. All these tree huggers may have a point about not eating Red Meat. Watch out for the Big 6, Fat, Saturated Fat, Sodium, Sugar, Cholesterol, and Carbs. You also want to watch out for Condiments like Mayonnaise, Ketchup, Salsa, Relish, Salt, Etc they are Really Bad. Water is a Big Key to Cleansing. Drink 8 or more Glasses/Bottles a day. This product is not intended or recommended for pregnant or nursing mothers. If you have a Serious Health problem. or if you are on prescription Medication consult a physician before taking this product. While Expelling Parasites, Toxins, and Candida. Certain things sometimes occur. If you experience any discomfort or side effects other than the normal signs of detoxification. Experts and Ancient use of herbals say that some of the following though short in duration may be normal in detoxifying. And usually once through it, the person will feel better than ever. Mild discomforts may include headache, dizziness, nausea, fatigue, bloating, Skin Irritation, redness or irritability. If this happens or they are bothersome, you may want to decrease the dose of the pills, fiber, and tea for a couple of days. If you have any kind of allergic reaction to any of the ingredients in this product, stop using this product.